Carrick-a-Rede rope bridge, one of Northern Ireland's best known tourist attractions, has reopened after being vandalised. It was closed on Wednesday after vandals tried to cut through its ropes. 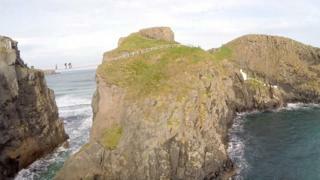 The bridge, suspended almost 100ft (30m) above sea level, connects two cliffs off Ballintoy, County Antrim. The National Trust, which operates the site, described the vandalism as "mindless" and said it could have had "very dangerous consequences". Hundreds of visitors were turned away on Wednesday as safety inspections were carried out. Police said a hand rope and supporting ropes had been cut and they are investigating the incident as "criminal damage". "We're thankful to get the engineers up on site so promptly this afternoon and work through the process of getting it repaired," Frank Devlin of the National Trust told BBC Radio Ulster's Evening Extra on Wednesday. "Tourism is such an important part of the economy here in Northern Ireland. The potential for the bridge to have been out of action for much longer was very high." Earlier, Mr Devlin said "At some stage last night, someone cut one of the ropes on the bridge. "It's not cut the whole way through, but it's cut significantly that we have had to close the bridge today and we can't allow anyone to cross." He added: "Thankfully, due to the vigilance of our staff at the site this morning, we picked up the damage before anyone had access to the bridge." A rope bridge was first erected on the site by fishermen in 1755. In more recent years, it has become a very popular crossing point for daredevil tourists with a head for heights. Last year, the National Trust recorded its highest ever number of visitors to the attraction. It led to the trust introducing "timed tickets" to deal with the crowds waiting to cross the bridge. PSNI Insp Colin Reeves said: "Sometime between 6.30pm on Tuesday 23 May and 9.30am on Wednesday 24 May, a padlock on the gate which leads to the bridge was removed. "The hand rope on the right hand side of the rope bridge and supporting ropes at the side of the bridge were partially cut." He appealed for witnesses to contact police.